*Note that we use the term biohacking as it has been used since 1988 to refer to DIY biology (Strange, 1988). More recently biohacking has been used also to refer to strategies to enhance the human body through wearable technology and nutritional supplements. Imagine a typical industrial process – say the production of gasoline or polyethylene plastic. It starts with non-renewable petrochemical resource that is transformed to the desired product through a series of catalytic steps, many requiring high temperature and pressure or dangerous solvents. Now imagine that process biohacked. Start with a renewable, possibly even carbon neutral resource, such as algal oils, starch or cellulose. Use enzymes for catalysis, eliminating the need for energy-demanding heat and pressure. Design and engineer the enzymes to optimize product formation by way of custom-built active sites and kinetic properties. Or, create enzymes that have never been seen before, designed to carry out reactions unheard of in nature and to work on reactants and products beyond Nature’s chemical repertoire. Finally, optimize the process to maximize the flow of reactants to product, for example by silencing or blocking competing reactions. This report describes the opportunities afforded by industrialized biology (or, as I like to think of it, biohacked industry) by providing examples of current successes, identifying targets to increase industrial biology’s scope and efficiency, and laying out a roadmap and ten-year plan. Industrial biology rests upon the foundation of biology, from fermentation to recombinant DNA technology, enzyme evolution, bioinformatics, systems biology, synthetic biology, and genome editing, all guided by the principles of engineering (design, build, test, learn), and informed by the wealth of knowledge of chemical space. The report features a vision in which the production of industrial compounds (whether therapeutic molecules, plastics or biofuels) can be optimized by incorporating biology into their production. Biology can be incorporated into the choice of starting material (feedstock), transformation processes (enzyme design and pathway optimization), and chassis selection (cell based or cell free). The report demonstrates the power of merging the best of biology with the best of chemistry through several examples, including the three summarized here. Artemisinin: Boosting natural product production by gene transfer to E. coli, plus chemical transformation. Artemisinin is a natural plant product produced by Artemisia annua that has anti-malarial properties; Tu Youyou was awarded the 2015 Nobel Prize in Physiology or Medicine for her pioneering work on artemisinin. As artemisinin production is limited by the availability of plant matter, a semisynthetic method was developed to supplement natural supplies. The biochemical pathway for the synthesis of artemisinic acid, precursor of artemisinin, was introduced into E. coli by transferring genes isolated from yeast and Artemisia annua. Artemisinic acid can be chemically transformed to artemisinin (Keasling, 2012). This approach demonstrates that an optimized production process may draw on several approaches including traditional chemical methods. Cold water protease: Saving energy by rational design of low-temperature optimized enzymes. Americans do 45 billion loads of laundry a year, consuming 54 billion kWh in energy of which 80% is used to heat water. To lower laundry’s energy footprint, protease enzymes have been developed that clean clothes effectively in cold water. The cold-water proteases were designed by mapping protein stability and activity using massively parallel predictive screens combined with the modeling of physicochemical and structural constraints; see more at this video from DuPont. This kind of approach also can be used to modify enzyme specificities and catalytic functions, opening the door for enzymology to move beyond its current limitations of biochemical space and into the whole of chemical space. Biodegradable polymers (polylactic acid). Plastics are traditionally made from petrochemicals and are poorly biodegradable, so the conventional plastic industry can be summarized as the large-scale transfer of belowground precursors to products in landfills. Plant-derived plastics start with renewable resources and end with biodegradable products. One success story is the development of polylactic acid (PLA) polymers. Agricultural byproducts such as corn cobs are fermented to produce lactic acid, which is then polymerized into biodegradable plastic products such as water bottles, textiles and disposable cutlery. The efficiency of the fermentation step has been optimized through microbial selection and microbial engineering (Madhavan Nampoothiri et al., 2010). For more information see NatureWorks LLC, an article from Smithsonian, and clip and article from How Stuff Works. This approach demonstrates that products traditionally of petrochemical origin can be produced in a more environmentally-friendly, bio-based manner. Where does plant biology fit into industrial biology? Plants feature in this greener vision in several ways. First, as photosynthetic organisms, plants are excellent sources of renewable feedstocks, such as the starch and cellulose currently used in the production of biofuels. Second, plants are sources of thousands of bioactive natural products that can be exploited as medicines, pesticides etc., but they are also sources of the enzymes and pathways that produce these products, which can be extracted, tweaked and modified to explore beyond the boundaries of biochemical space. Finally, plants can be the chassis or factories of industrial biology. The single-celled green alga Chlamydomonas reinhardtii has been established as a host for biotechnology (Rasala et al., 2014; Scaife et al, 2015), and land plants from moss (Reski et al., 2015) to angiosperms have been successfully used for the production of biofuels, vaccines and therapeutics. A recent high-profile application of plants in industrial biology was the production in tobacco of the Ebola therapeutic ZMapp (Arntzen, 2015). One key to enhancing plant’s contribution to industrial biology will be the development of standardized tools and parts for cloning and gene assembly (see for example Patron, 2014 and OpenPlant). Full industrialization of biology requires the development of improved tools for data mining, interpreting, and design; we need computer-aided design tools. It is easy to imagine the questions we would want to have our computer-aided design system explore. For example, suppose we wanted to make product X. What are the optimal starting materials? What are all of the different pathways for production of X in the natural world? Can our software predict additional pathways that should be feasible but that haven’t been identified? If X is a novel compound, what natural products resemble X that could be used as a substrate for chemical transformation? Can the metabolic pathway for X be introduced into a single-celled system, or would a cell-free system be more efficient? What do the natural variants of key enzymes tell us about the constraints on their activity? Can key enzymes be optimized through directed evolution? What competing pathways and processes should be eliminated? Etc. Creating a system that probes biological and chemical space to identify best pathways depends on the development and adoption of a unified language and data structure. These needs are well known to both the systems biology and synthetic biology communities. SBML is the systems biology markup language (Hucka et al., 2003), and SBOL is the synthetic biology open language (Galdzicki et al., 2014), each of which provides a community standard for communication and sharing (and each of which has a corresponding visual language). BioBricks are standardized gene parts to support biohacking; modular DNA elements that snap together like Lego that are widely used and also created by teams of undergraduate and high school students as they build genetically-modified machines to compete in the international iGEM competition (Kelwick et al., 2015). (Note that plants also are being used for iGEM projects). The biological sciences are being transformed from the bottom up, by way of public-access labs, open source code, open access publications and a maker mentality such as DYIBio that lets anyone be a biochemist. Community labs are springing up that provide space and equipment for citizen-biologists to create and explore. Online networks and user forums provide support for experimenters, including how to edit genomes using CRISPR/Cas to 3D printing your own centrifuge (see Ledford, 2015; Bilba, 2011). Students whose introduction to biology is by way of a community lab or iGEM experience are primed to be innovators in the coming biological industrial revolution. For those students whose introduction to biology is by way of the traditional university lecture hall, I hope that their instructors pass on the vision outlined in this report, through case studies and research projects. By exposing students to the applications of industrial biology, we can prepare them for the biohacked future and inspire them to participate in it. Arntzen, C. (2015). Plant-made pharmaceuticals: from ‘Edible Vaccines’ to Ebola therapeutics. Plant Biotechnol. J. 13: 1013-1016. Biba, E. (2011). Genome at home: Biohackers build their own labs. Wired. (August 19, 2011). Galdzicki, M., et al. (2014). The Synthetic Biology Open Language (SBOL) provides a community standard for communicating designs in synthetic biology. Nat Biotech. 32: 545-550. Hucka, M., et al. (2003). The systems biology markup language (SBML): a medium for representation and exchange of biochemical network models. Bioinformatics. 19: 524-531. Keasling, J.D. (2012). 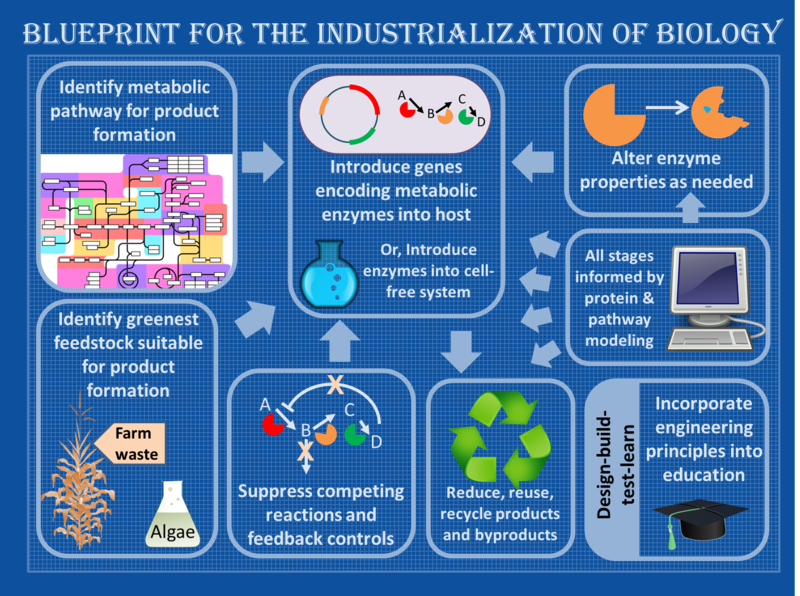 Synthetic biology and the development of tools for metabolic engineering. Metabolic Engineering. 14: 189-195. Kelwick, R., Bowater, L., Yeoman, K.H. and Bowater, R.P. (2015). Promoting microbiology education through the iGEM synthetic biology competition. FEMS Microbiol. Lett. 362: fnv129. Ledford, H. (2015). Biohackers gear up for genome editing. Nature. 534: 398 – 399. National Research Council (2015). Industrialization of Biology: A Roadmap to Accelerate the Advanced Manufacturing of Chemicals. National Academies Press, Washington D.C.
Madhavan Nampoothiri, K., Nair, N.R. and John, R.P. (2010). An overview of the recent developments in polylactide (PLA) research. Bioresource Technology. 101: 8493-8501. Patron, N.J. (2014). DNA assembly for plant biology: techniques and tools. Curr. Opin. Plant Biol. 19: 14-19. Rasala, B.A., Chao, S.-S., Pier, M., Barrera, D.J. and Mayfield, S.P. (2014). Enhanced genetic tools for engineering multigene traits into green algae. PLoS One. 9: e94028. Reski, R., Parsons, J. and Decker, E.L. (2015). Moss-made pharmaceuticals: from bench to bedside. Plant Biotech. J. 13: 1191-1198. Scaife, M.A., Nguyen, G.T.D.T., Rico, J., Lambert, D., Helliwell, K.E. and Smith, A.G. (2015). Establishing Chlamydomonas reinhardtii as an industrial biotechnology host. Plant J. 82: 532-546. Strange, M. (1988). Playing God in your basement. Washington Post. (January 31, 1988).